Eye Magazine | Blog | Is the museum as dead as print? Speakers Claire Bishop, associate professor at City University of New York’s Graduate Center and Dorothea von Hantelmann, art history lecturer at the Free University of Berlin, provided the day’s talks with a theoretical framework. Bishop addressed the ‘double identity’ of site-specific artwork, contextually altered by new environments and alternative modes of photographic or video representation. 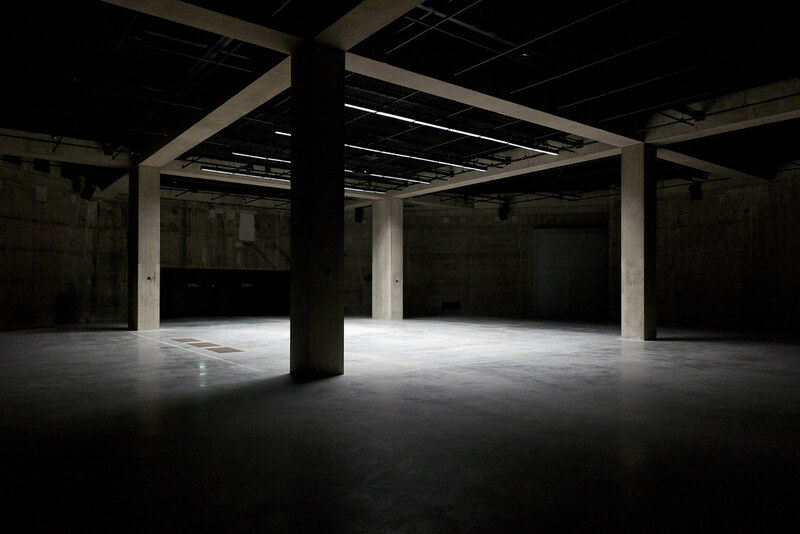 Slides of Tino Sehgal’s 2002 piece Kiss were positioned among echoes of rehearsals, from beyond the conference walls, for his work These Associations, which opened in the Turbine Hall on 24 July. Top: The Tanks at Tate Modern. Photo: Tate Photography. 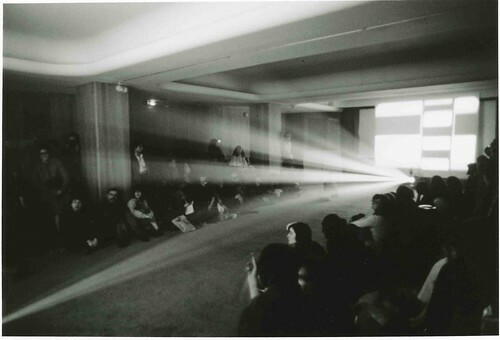 Dorothea von Hantelmann attempted to tackle the paradox between immersion and distance through the exhibited object and its detachment from original context. Her research considers what it means to create art in the absence of objects, in a social setting as enabled by The Tanks. 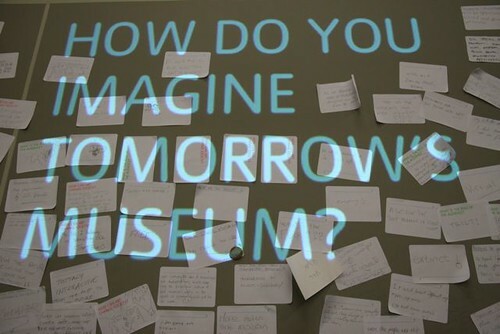 Von Hantelmann asked where the museum as an institution is heading. In her view, the future will be decided not by professionals but by the audience, in a time-based and experiential setting. 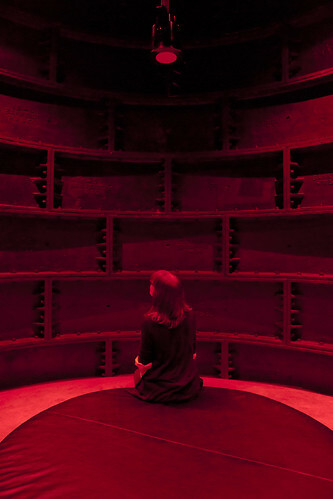 By way of example, Lis Rhodes re-enacted her participatory cinematic piece Light Music (1975) in a portion of one of the three decommissioned concrete oil tanks, now a permanent fixture in the bowels of the gallery. Lis Rhodes, Light Music, Paris 1987. Copyright: Lis Rhodes. Lin Chi-Wei quietly performed a 40 minute piece that unravelled hundreds of metres of black silk ribbon into the hands of the symposium audience. They read aloud the phonetic translation of traditional Chinese characters embroidered in yellow thread, an act symbolic of collectiveness and connectedness. Later during panel discussions, a South African audience member addressed the potential for museums without walls, posing the idea that South Africa is of itself a museum of race, politics, plantations and colonialism, made a spectacle for Western audiences. A cultural inside, exposed in ‘place’. His comments were perhaps best exemplified through Zimbabwean artist Jelili Atiku, the fourteenth instalment of whose guerrilla theatre-inspired series ‘Gbangbayahu: an intervention of human dignities’ was performed live. Suzanne Lacy, The Crystal Quilt, Minneapolis 1987. Copyright: Suzanne Lacy in collaboration with Phyllis Jane Rose, Miriam Schapiro, Susan Stone, Nancy Dennis, and Sage Cowles. The symposium concluded with Suzanne Lacy, creator of The Crystal Quilt. 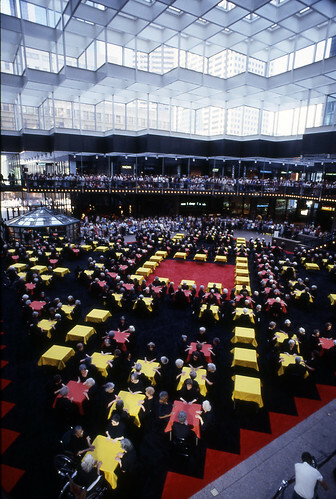 The 1987 Minneapolis piece is exhibited as a time-lapse video and sound installation documenting the drawing together of under-represented elderly women in the media spotlight. During a question-and-answer session, the Tate Modern’s Catherine Wood, curator of contemporary art and performance, said that The Tanks consume ‘spaces underneath, in the subconscious of the rest of the museum in some way’ but at what will be the centre of architects Herzog & de Meuron’s new 21,000 square metre space. For one member of the audience, the only future for the museum is extinction. However ‘the end of museums’ sounded similar to the familiar graphic design rhetoric about ‘the end of print’ – neither rings true. I revisited Sehgal’s These Associations in the Turbine Hall after the symposium. While some spectators kept their distance, watching from an overhead bridge, others stood among the art. As it seeped from doorways and jogged in and around the audience, we listened to the performance breathe, speak and sing; a further demonstration that the museum is very much alive. See also ‘(No)end of print.’ Reports of print’s death have been greatly exaggerated, written by Steve Fisher for Eye blog and John Ridpath’s ‘Tangible digital’ How can we make the virtual more physical while bringing emotion into the digital domain?, from Eye 80 Summer 2011. Also: ‘Artspeak’ by David Thompson in Eye 62.